Play with your dog. It’s Positively Rewarding. The Zoom Room is a dedicated canine event center. Yes, you can party with your dog. And your friends. And their dogs. We have an incredible array of special events and gatherings, all of them designed to present you and your dog with an unprecedented opportunity for socialization. Because we all love a good time, but your dog needs socialization for long-term development. Exposure to novel sights, sounds, smells, people, and other dogs in a safe, clean, expertly-supervised environment is key to a dog’s well-being and happiness. 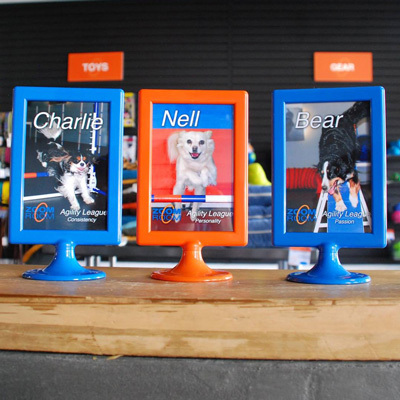 Zoom Room Playgroups provide you and your dog or puppy with an exclusive indoor dog park. 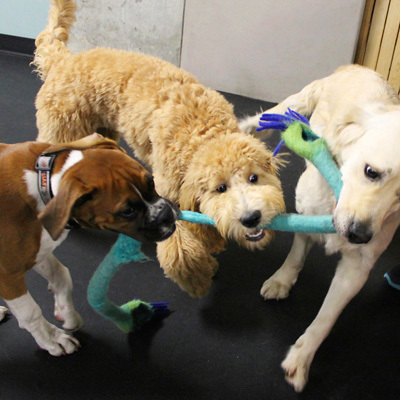 Playgroups provide off-leash socialization in the company of other great dog owners. An experienced dog trainer supervises, assists with interactions, and answers all questions. The very best gift you can give your dog is socialization in a safe, controlled environment, and plenty of it! We’ve all been to the dog park, but now you can go somewhere better! Avoid the mud, the rain, the snow, the heat, the latte-drinking cell-phone chatterers, and the mean dogs that steal toys. We outlaw it all! (But we do like caffeine, so we provide free fair trade coffee.) Instead, come take advantage of our affordable Playgroups, whatever the weather! 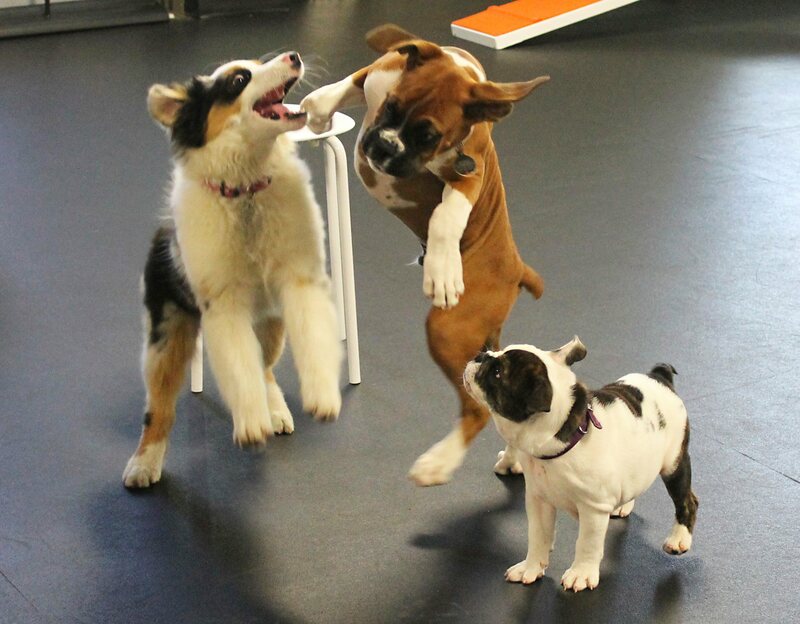 Our Playgroups provide you and your dog with an exclusive indoor dog park. Our playgroups are a great way to provide your dog with off-leash socialization. It’s also a great way to connect with other great dog owners. One of the best kept secrets of our playgroups is that the watchful eye of an experienced trainer is there the whole time, able to assist with etiquette and interactions and available to answer any and all questions. You and your dog will enjoy free use of most of the dog agility obstacles, plus our awesomely-stocked toy chest. There’s something in there for everyone, so toss a ball, dig into a great puzzle, or soar over the A-frame and leap the hurdles. Each playgroup is limited to dogs of like size. We offer Puppy Playgroup, Small Breed Playgroup, Medium Breed Playgroup, and Large Breed Playgroup. All dogs in our Playgroups have been screened to ensure they are social, and up to date on all vaccinations. If you’re already in group classes, please ask your trainer to approve your dog for Playgroups. If not, please schedule a Playgroup Evaluation, which consists of attending one of our Basic Manners classes, so that the trainer can evaluate your dog in the context of a social setting. Dog Birthday Parties or a Puppy Party? 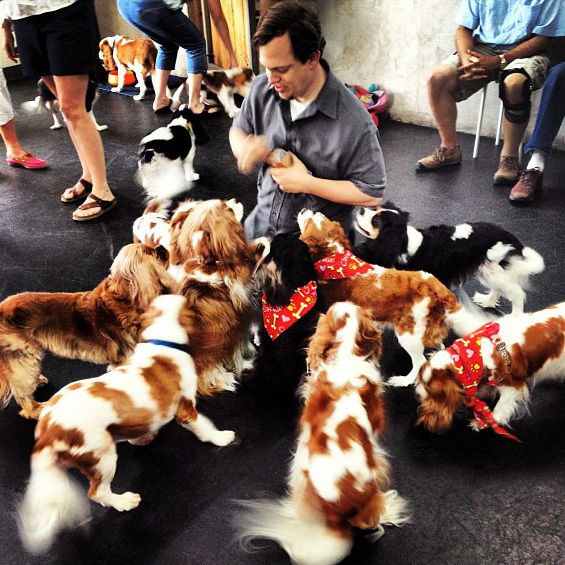 Our canine event center is the perfect place for dog birthday parties. The Zoom Room has all the toys, treats and party favors, plus easy clean-up in a safe, indoor, climate-controlled, fun-filled facility. Choose your favorite theme and we’ll create a private, personalized puppy party experience. If it’s your dog’s birthday, the Zoom Room should be your destination! All the fun and zero clean-up. And dogs love to play on our dog agility course. We love rescues! Many Zoom Room members have adopted their dogs from shelters and rescue organizations – so there’s a good chance you might not know your dog’s actual birthday. That’s fine by us – as many dog owners love to celebrate the anniversary of their dog’s adoption – that special day when you opened your heart and home to your new best friend. Whether it’s a dog birthday party or an adoption anniversary or any other special occasion, the Zoom Room hopes to be your celebration destination. Your kids will also love our treats and dog agility course – so remember that we can also help you celebrate human birthdays, in addition to dog birthday parties! Kids can celebrate their own birthday with their dog, and their friends, and their friends’ dogs. Heck, we’ve even hosted engagement parties for grown-ups who met thanks to their dogs. HALLOWEEN, VALENTINE’S DAY & MUCH MORE! The Zoom Room also hosts its own parties on holidays and any other special occasion that provides a good excuse for throwing a big bash. View a list of upcoming special events at your local Zoom Room. Do you belong to a dog breed or other canine Meet-Up Group? The Zoom Room is perfect for your next Meet-Up. An alternative to the dog park, host your meet-up in our climate-controlled indoor space where you can turn on the Disco Ball, play music of your choosing, serve refreshments, and have a blast! Have your organizer get in touch with us and we can take care of all the arrangements. Typically our Meet-Up rentals are 90 minutes long. You can handle the RSVPs from your members yourself, or we can take care of that as well. Your members will thank you! There are only so many dog parks you can go to for your events, so why not treat them to an indoor meet-up at the Zoom Room!? Happy Hour for your employees or members with their dogs? Singles mixers where people get to meet the four-legged significant other of their potential significant other? We have catered parties from the laidback to the utterly extravagant. We can provide all the bells and whistles, or you can bring in the goodies yourself and leave the supervision, setup and cleanup to us. Please contact your local Zoom Room for more information. We specialize in throwing unforgettable charitable fundraisers for an enormous variety of shelters, rescue groups, and other non-profit organizations concerned with animal welfare. If instead of a Meet-Up Group, your organization is a shelter or non-profit rescue, please select “Rescue Groups” above for more information. The Zoom Room is committed to raising funds and awareness for dog rescue groups, animal shelters, humane societies and animal welfare organizations. The Zoom Room hosts fundraisers, encourages the adoption of rescue dogs, and assists with their ongoing training. From the very day a new Zoom Room opens its doors, it begins its commitment to serve the dedicated, passionate dog rescue groups, animal shelters, humane societies and animal welfare organizations that work so diligently to improve the lives of dogs in their community. Yes, we throw great parties. But our parties aren’t really parties unless there is an opportunity to partner with one of these great rescue groups to make it the beneficiary of our efforts. We specialize in throwing unforgettable charitable fundraisers for an enormous variety of animal shelters, dog rescue groups, and other non-profit organizations concerned with animal welfare. Please contact your local Zoom Room to let us know how we can best serve you. Whether you’re at the local or national level, we can cater the perfect fundraiser for you – the hands-down best option for raising money and awareness at an event to which attendees can actually bring their own dogs. Our most popular option is throwing a Doggy Disco® party complete with disco ball and laser lights on the floor for the dogs to chase. At these events, we provide everything, and even help you solicit additional donations during the festivities. We’ll reach out to our own clients and to the community of dog lovers at large to increase attendance and exposure for your mission. The Zoom Room is the perfect spot for your rescue group to hold its next dog adoption event! Or consider partnering with us to make this a regular weekly or monthly event. All locations have dedicated space for pet adoptions either indoors or just outside. We can assist you with signage, tents, marketing, refreshments, and we’ll even extend special discounts on training and basic supplies to further encourage all visitors to open their homes to their new best friend. Please contact your local Zoom Room to make arrangements for your rescue group’s next dog adoption event! At a growing number of Zoom Room locations, we are now offering low-cost microchip implant services. We will safely microchip your dog, add all of your contact information to the national database, and maintain your dog’s microchip number in our own records to further facilitate the safe return of your dog if she is ever lost. We do all of this at a mere fraction of the cost you’d find at veterinarian offices. Microchipping your dog is one of the easiest steps you can take to eliminate the number of dogs entering animal shelters. Learn more about our low-cost Microchipping. As the vast, vast majority of all dogs who enter the Zoom Room were rescued from shelters or thanks to the diligent efforts of great rescue groups, we have tailored our dog training offerings to expressly embrace these wonderful animals and the often less-than-ideal life they lived prior to finding their new, loving homes. Our Shy Dog class, for example, is perfect for rescue dogs – whether newly adopted or in your home for some time but still struggling with anxieties. Additionally, we extend special discounts and even free training to many local shelters in an effort to make the dogs they house all the more adoptable. In study after study, it has been seen that dogs in animal shelters who have even a modicum of basic training are far more likely to be adopted. Therefore we do everything we can to facilitate this basic training. Here is a growing list of the humane societies, dog rescue groups, animal welfare organizations, dog adoption teams, and animal shelters that we are incredibly proud to call our community partners and the beneficiaries of our ongoing efforts at raising both funds and awareness to support their estimable goals. We cannot urge you strongly enough to donate your time, money, and resources to these rescue groups and charitable organizations. Angel City Pit Bulls is a 501c3 non-profit organization dedicated to creating a better future for pit bulls by promoting their positive image as loving family companions through education, public advocacy, adoptions, and responsible pet ownership. Learn more about Angel City Pit Bulls. Rescue Me Incorporated’s ultimate dream is to provide a NO KILL Animal Rescue Sanctuary and Rehab facility for the homeless, abused, abandoned, neglected senior and special needs orphans currently in our care and the countless ones still awaiting rescue. Learn more about Rescue Me. Learn more about Rescue Train. spcaLA is an independent, nonprofit animal welfare organization serving Southern California since 1877. Donations run programs and services including Cruelty Investigation, Disaster Animal Response Team, Humane Education and a variety of shelter services. The mission of Four Legged Friends Foundation is to promote programs that save family pets, increase adoptions and share the joy pets bring to people. Learn more about Four Legged Friends Foundation. Peace of Mind Dog Rescue is dedicated to finding new loving homes for dogs whose senior guardians can no longer care for them due to illness, death, or other challenging circumstances, and to finding homes for senior dogs in animal shelters. Learn more about Peace of Mind Dog Rescue. AFRP is dedicated to finding good permanent homes for abandoned, stray, and abused companion animals and ending the pet overpopulation crisis through focused spay/neuter programs. Learn more about Animal Friends Rescue Project. The SPCA for Monterey County’s mission is to assure compassionate and humane treatment of all animals in our community. Learn more about The SPCA for Monterey County. Operation Blankets of Love (OBOL) is an award-winning non-profit 501(c)3 public charity. They collect, transport and distribute recycled and new pet-related items to comfort stray, sick, neglected and abused homeless animals in shelters, rescue groups, sanctuaries and foster groups. In addition, as an Emergency Response Team, they partner with those organizations to provide relief and comfort to animals that are displaced or endangered by catastrophe. Learn more about Operation Blankets of Love. Take Me Home is a non-profit, volunteer-based organization that has been saving the lives of homeless animals for more than nine years. They work in conjunction with shelters and rescues throughout California and beyond to help save animals on death row, on the streets or in unsafe living conditions. Their team is driven by love, compassion and doing right by innocent animals who have no voice. Learn more about Take Me Home. Tails of the City Animal Rescue is an all-volunteer, 501(c)(3) no-kill organization, dedicated to the rescue, treatment, boarding and rehoming of animals in the greater Los Angeles area. Adoptions are held every Saturday from 1-4pm at the Petco on LaBrea in Los Angeles (intersection of 2nd and LaBrea, behind the Ralphs on 3rd and LaBrea). Learn more about Tails of the City Animal Rescue. 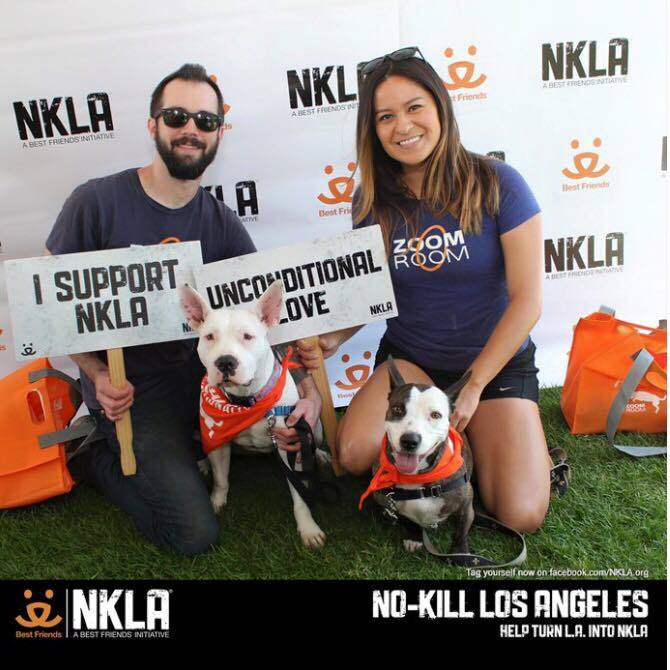 L.A. Love & Leashes is a program of Friends of LA Animal Shelters, a volunteer-run nonprofit dedicated to helping Los Angeles Animal Services increase adoptions and raise the live save rate for the 50,000+ animals taken in by our city shelters each year. Learn more about LA Love and Leashes. The Bill Foundation is a California 501(c)(3) non-profit foundation dedicated to rescuing dogs from the Los Angeles shelter system and placing them in permanent loving homes. Learn more about The Bill Foundation. The Inland Valley Humane Society & S.P.C.A. is a private, non-profit organization. They provide animal care and control services to nine cities in the eastern Los Angeles County area. The doors to the Inland Valley Humane Society & S.P.C.A. are open to every animal in need. Because we are a “full access” shelter, no animal is ever turned away. Learn more about Inland Valley Humane Society & SPCA. Learn more about Humane Society Silicon Valley. CARE’s mission is to find good, permanent homes for dogs and puppies that were abandoned, relinquished, or found and never reclaimed. CARE will provide temporary shelter, food, love, and medical care to these foster pets until they are placed. Learn more about Companion Animal Rescue Effort. This is an all-volunteer group dedicated to the rescue and re-homing of adoptable German Shorthaired Pointers in northern California. Learn more about NorCal GSP Rescue. This all-breed dog rescue, based in the SF Bay Area, rescues dogs from Northern California shelters. It is a foster-based rescue and relies on foster homes to help dogs on their way to adoption. Learn more about Copper’s Dream. The goal of this rescue is to rescue and provide shelter, loving attention, food, and all necessary medical care to dogs, cats, puppies, and kittens who have run out of time at public facilities. Learn more about Pets in Need. Biggest dog rescue organization in the San Francisco Peninsula. Other than dogs for adoption, this organization provides pray and neuter services, dog training, etc. Learn more about Peninsula Humane Society & SPCA. The Lovejoy Foundation is an animal rescue foundation formed to make a difference in the lives of the many homeless animals, who are abandoned, neglected and abused. Learn more about The Lovejoy Foundation. Big Dogs Huge Paws was founded on the core philosophy is that every “BIG” dog deserves a chance. Zoom Room Longmont proudly offers discounted training for BDHPI dogs in foster to ensure their best chance at a forever home. Learn more about Big Dogs Huge Paws, Inc..
Shiba Scout Rescue is a non-profit, no-kill organization dedicated to the rescue, training and rehoming of Shiba Inus and Shiba Inu mixes. Zoom Room Longmont proudly hosts adoption days and social gatherings for the Shiba rescue. Learn more about Shiba Scout Rescue. Every day, RMGDRI save the lives of Great Danes by rescuing them from harmful situations and then funding their medical care, pet medications, advanced surgical treatments, spay/neuters, food and shelter. Zoom Room Longmont proudly offers discounted training for Danes in foster care to enable them a better chance at a forever home. Learn more about Rocky Mountain Great Dane Rescue. A Soft Place to Land gives retired Mill dogs a new leash on life! Zoom Room Longmont proudly enjoys hosting social get togethers for this rescue and helping with training to bring these dogs out of their shells. Learn more about A Soft Place to Land. Dalmation Rescue of Colorado is dedicated to locating permanent, loving homes for unwanted or abandoned Dalmatians. Zoom Room Longmont proudly offers discounted training for dogs in their foster care to help them be ready for their forever homes. Learn more about Dalmation Rescue of Colorado. New Hope Cattle Dogs’ mission is helping discarded, stray and unwanted Australian Cattle Dogs (ACD’s) that need a second chance at finding a forever home and providing education and training to the public. Zoom Room Longmont has proudly hosted fundraisers and offers discounted training as needed. Learn more about New Hope Cattle Dog Rescue of Colorado. Golden Retriever Rescue of the Rockies is dedicated to the rescue, placement and public awareness to ensure that Golden Retrievers are adopted by people able to provide a safe, loving home. Zoom Room Longmont has donated gift certificates and products for their silent auction events. Learn more about Golden Retriever Rescue of the Rockies. Every Creature Counts is dedicated to rescuing cats and dogs that are slated for euthanasia, finding loving homes for them, and offering very low cost spay/neuter and other veterinary services. Zoom Room Longmont has proudly hosted adoption events with ECC. Learn more about Every Creature Counts. It is the mission of the Humane Society of Boulder Valley (HSBV) to protect and enhance the lives of companion animals by promoting healthy relationships between pets and people. Zoom Room Longmont is happy to support HSBV at special events and fundraising. Learn more about Humane Society of Boulder Valley. Longmont Humane Society (LHS) provides temporary shelter to thousands of animals every year: dogs, cats, small mammals, and birds who are lost, abandoned, or surrendered. Loving attention, nutritious food, meticulous health care and daily exercise are standard parts of the high-quality care provided to each animal. Zoom Room Longmont supports LHS by participating in Ella’s Walk and Paws in the Park. Learn more about Longmont Humane Society. Founded in 1910, the Dumb Friends League is a leader in providing humane care to companion animals—sheltering lost and relinquished pets, adopting pets to new homes, investigating animal cruelty, reducing pet overpopulation, and educating the public about animals and their needs. The Dumb Friends League is the largest community-based animal sheltering organization in the Rocky Mountain region. Learn more about Dumb Friends League. Believing that all Retrievers deserve a safe, loving home, the mission of Retriever Rescue of Colorado is to rescue abandoned, abused, neglected and unwanted retrievers and to promote public education on animal-related issues. All rescued dogs are fostered prior to adoption. This organization prides itself on providing safe and promising second chances to these dogs while they await their new homes. Foster homes allow for social development and many times direction for learning basic commands, housebreaking and exposure to children, cats, and other dogs. Learn more about Retriever Rescue of Colorado. International Hearing Dog, Inc. rescues dogs from local animal shelters, trains them to assist the hearing impaired then places them with recipients throughout the US and Canada free of charge. Once the Hearing Dog has been placed, IHDI staff remain in contact throughout the life of the dog to provide support, advice and guidance. IHDI is a 501(c)(3) nonprofit organization headquartered in Henderson, Colorado and relies entirely on community support to run our program. Zoom Room Longmont is a proud sponsor of IHDI! Learn more about International Hearing Dog, Inc. The Florida Humane Society serves as a primary adoption facility rescuing companion animals from animal control and owner surrenders. The Florida Humane Society serves the needs of Broward and Palm Beach Counties and all of South Florida. Learn more about Florida Humane Society. The Tri County Humane Society for the prevention of cruelty to animals believes animals, as living creatures, have value beyond economic measure and are entitled to legal, moral, ethical consideration, and protection. The Tri County Humane Society is a 100% no kill shelter and a 100% not for profit shelter. Learn more about Tri County Humane Society. Adopt-A-Bull Rescue, Inc. is a not-for-profit English Bulldog Rescue organization based in South Florida. Adopt-A-Bull Rescue is a network of bulldog lovers and volunteers with an unyielding desire to help English Bulldogs in need of an “intervention”. Learn more about Adopt-A-Bull Rescue. Get-A-Life Pet Rescue volunteers retrieve pets who have been abandoned and provide them with a chance at the life they deserve. Get-A-Life Pets come from a variety of sources, including Animal Services, owner surrenders and as strays. Learn more about Get-A-Life Pet Rescue. The mission of American Humane Association is to ensure the welfare, wellness and well-being of children and animals, and to unleash the full potential of the bond between humans and animals to the mutual benefit of both. The Zoom Room is a proud official sponsor of the AHA’s Hero Dog Awards. Learn more about American Humane Association. Morris Animal Foundation helps animals worldwide enjoy longer, healthier lives. Foundation funding supports approximately 300 research projects each year at more than 60 of the world’s most respected research institutions, colleges of veterinary medicine and zoos. Since its inception, the Foundation has funded more than 1,700 humane animal health studies that have benefited animals on every continent. Learn more about Morris Animal Foundation. Learn more about Greater Charlotte SPCA. We are devoted to helping abandoned and abused cats and dogs throughout the greater Charlotte area find loving homes. Learn more about Carolina P.A.W.S (Pet Adoption & Welfare Society). The Humane Society of Charlotte is a community resource committed to improving the lives of companion animals through adoption, spay/neuter and education. Learn more about Humane Society of Charlotte. Learn more about Charlotte-Mecklenburg Animal Care & Control. The mission of PALS (Pet Adoption League Society, Inc.) is to advocate for animal welfare by seeking to end the senseless deaths of companion animals. Learn more about PALS – Pet Adoption League Society, Inc..
For almost 20 years, Animal Trustees of Austin has provided safe, compassionate and affordable treatment for animals in our community regardless of their owner’s income. Learn more about Animal Trustees of Austin. As the largest no-kill, non-profit pet adoption center in Austin, the Austin Humane Society is dedicated to saving Austin’s homeless dogs and cats, educating our community about responsible pet ownership, and reducing pet over-population. Learn more about Austin Humane Society. Austin Dog Alliance provides a variety of services, including pet therapy and pet training classes, dog-assisted social skill classes designed for children with autism spectrum disorder, after-school enrichment and summer camps. Austin Dog Alliance’s handler-dog teams visit local hospitals, rehabilitation centers and nursing homes and work with at-risk readers at schools and libraries. Learn more about Austin Dog Alliance. Gold Ribbon Rescue’s main function is to provide a network for sheltering, rehabilitation and placing Golden Retrievers in permanent homes in Central Texas. Gold Ribbon Rescue also provides public education about responsible dog ownership and, in particular, about the Golden Retriever breed. Learn more about Gold Ribbon Rescue. Learn more about Forgotten Friends Mixed Breed Rescue. Castaway Pet Rescue is a nonprofit, volunteer-based, rescue dedicated to rescuing and adopting homeless dogs into loving homes. Learn more about Castaway Pet Rescue. Big Dogs Animal Rescue is an all-breed animal rescue involved in rescuing unwanted and neglected animals for over 15 years. Their focus is on taking in the most needy from animal shelters and animal control facilities. Learn more about Big Dogs Animal Rescue. Wisconsin Chihuahua Rescue is a foster-based group specializing in taking senior and medically challenged dogs from shelters for rehabilitation and permanent re-homing. Learn more about Wisconsin Chihuahua Rescue. The mission of Milwaukee Pets Alive (MPA) is to end the killing of Milwaukee’s homeless pets through comprehensive programs and resources benefiting and serving the people and companion animals of Milwaukee first. Their top priority is that all healthy, treatable and rehabilitatable animals at Milwaukee Area Domestic Animal Control Commission (MADACC) achieve live outcomes. Learn more about Milwaukee Pets Alive. The Wisconsin Humane Society (WHS) is a private nonprofit organization whose mission is to build a community where people value animals and treat them with respect and kindness. WHS has been saving the lives of animals in need for more than 130 years. Learn more about Wisconsin Humane Society. Havanese Rescue Inc is an independent charitable organization which is focused on rescuing and re-homing Havanese Dogs which are left homeless and in need of their care. Learn more about Havanese Rescue Inc..
Dog agility trials or competitions at the Zoom Room are fast-paced, fun, and open to all breeds and sizes of dogs. We have a relaxed, playful approach, embracing playfulness and camaraderie on our agility course. There are trophies and prizes, too! You may have seen high voltage agility competitions televised on ESPN or hosted at a local park or field. At the Zoom Room, we love the fast pace, but dial back the competitive aspect by injecting a more relaxed, fun and goofy approach. Any dog who has completed Agility 2 is welcome to participate in our weekly Agility League. Dogs pair off into teams after giving their team an impressively silly name and compete for trophies and bragging rights. Sure, you’ll find some Shepherds and Border Collies, but you’ll also find plenty of Chihuahua and Pug teams, loping Great Danes, and every imaginable lovable scamp. Each week we’ll set up a different dog agility course to challenge the teams. Each run is timed and scores are kept. Music, hot fair trade coffee, and good cheer complete the scene. League is a fantastic way to keep your dog fit and active, take pride in his progression and achievements in dog agility, and enjoy a great evening among other like-minded dog owners. Zoom Room Doggy Disco® parties are perfect for dog birthdays, adoption anniversaries, breed meet-ups and charity fundraisers. Exposure to novel cues aids in socialization, many dogs will love chasing the colorful lights, and you’ll enjoy your dog safely at play among friends. 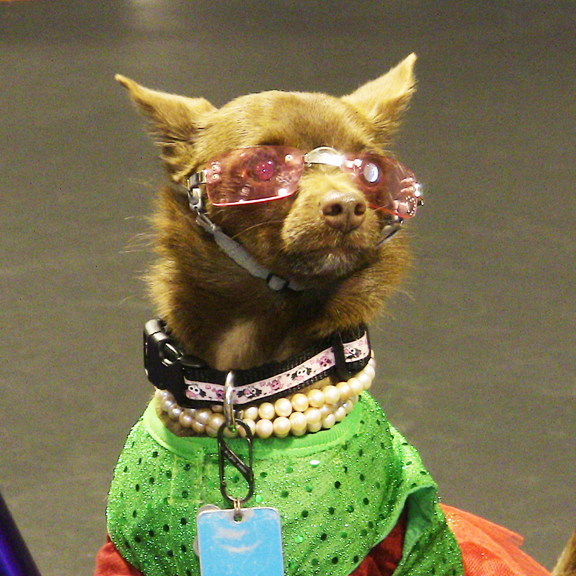 Why not invite your dog and pals to party like rock stars at the Zoom Room? 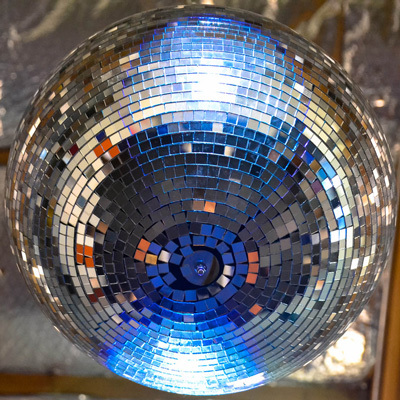 Our Doggy Disco pulsates with glamour, revolving mirrored ball, professional lighting effects and a great sound system with deliciously danceable tunes. A ceiling-mounted laser light show projects a dizzying array of colors and patterns on the floor, perfect for pooches to chase. The idea behind Doggy Disco is simple: a completely interactive experience – perfectly in tune with the same philosophy found in all of our group training classes – promoting quality, active experiences between dog and owner to foster even greater bonds of communication and enjoyment. There is a method to this madness. There is no single more important factor in your dog’s long-term development than excellent socialization. While Doggy Disco is fun for owners, your dogs will be exposed to novel sights, sounds, smells, people, and other dogs in a safe, clean environment – aiding in the all-important acquisition of superb socialization. A Private Gym session in our indoor dog training gym includes access to our agility course and toy chest in a climate-controlled facility without having to worry about interactions with other dogs as you would at the dog park. It’s completely off leash, so you can get in some quality exercise time with your dog. While Playgroups provide the benefit of socialization and the presence of an expert dog trainer at all times, not every dog is suitably social to participate. For you, we offer Private Gym. Private Gym is available in half-hour increments. Our indoor dog park is always squeaky clean and climate controlled, with excellent music, too. Are you a serious dog agility competitor? Our dog gym will give you unlimited and uninterrupted access to our indoor training facility – just the thing to practice the obstacles and work on your time. Only dogs who have taken or are currently enrolled in our advanced agility classes may use the full course, including more advanced obstacles like the teeter totter. If you’re not enrolled, but wish to use all the obstacles, please schedule an Evaluation with us prior to your first Private Gym session. Current vaccination records are required. You can bring two dogs all by yourself. If you want to bring three dogs, you’ll need a second human handler. The Zoom Room offers additional services to responsible, passionate dog owners from time to time, such as microchip implants, anesthesia-free dental cleaning, adoption events, pet portrait photography and more. At various times, we also offer additional services and special events for you and your dog. Be sure to follow your local Zoom Room’s Facebook page or subscribe to their newsletter to stay informed of all upcoming activities. Microchipping your dog is incredibly fast, easy and painless, and one of the best things you can do to ensure that if your dog is ever lost, you will be able to safely bring her back home. Don’t you miss puppy breath and a delightful face lick? Good dental health for dogs, as it is for humans, is about much more than a pretty smile and fresh beath. A dirty mouth can lead to serious health issues well beyond the teeth and gums. This is an easy in and out procedure without need for drugs or anaesthesia of any kind. Whether you’re looking for your first dog or expanding your happy family, we support local rescues who bring in adorable pups eager for your love, warmth, and a permanent home. Experts discuss important topics, usually with audience participation and hands-on activities. Topics include First Aid & CPR, safe handling and interactions for kids with dogs, introducing a new dog to the family, special advice for expectant mothers, and much more. We bring in professional photographers, scenic backgrounds and props to create beautiful portraits of your dog (with or without the whole family). Like a temporary tattoo for dogs, this is a super fun way to quickly dress up your dog with an assortment of designs in a rainbow of colors. Totally safe and non-toxic, the paint washes off easily when you’re ready, but until then won’t come off on your clothes or your sofa. One of our most popular designs is pink ribbons for breast cancer awareness. Socialization is so important for dogs – and for us humans, too! So please swing on by your local Zoom Room so we can meet you and your dog and get this party started!